Hey, welcome to another income report! As usual, I'm happy to share what is happening across all of my brands. I have a number of different websites and as you can see, a significant portion of my income is derived from projects outside of anything related to NichePursuits.com. Having said that, you will see a nice uptick in earnings for my Niche Pursuits brand as well. Overall, I had a couple of brands that were down, but a couple of brands that were up. For everything combined, I ended up higher than last month. Also of note is the fact that one of my employees, Jake, was on vacation for the entire month of June. He was able to travel the country in an epic road trip with his family. Somehow we were able to prevent my business from crashing down without him. Having said that, it's great to have him back so we can move forward with a couple of projects! The best part is that I only get one shot at it, my self-imposed rule. The first selfie I take is the selfie you see. So, here I am on July 6th, 2017…this time outside my house! So, my fat finger accidentally hit the button before I was ready…oops! So, I'm not angry, I just wasn't ready for the picture. Oh well. I've come to a realization on a couple of things this month as it relates to my Niche Pursuits brands. First, I'm no good at making money from hosting commissions. I see other bloggers crushing it with hosting commissions, and I've always wanted a piece of the action. However, I think in the six years of owning this blog I've only crossed $1k per month a couple of times. But I've decided hosting commissions is not my calling in life, so I don't care anymore. Luckily, I have other ways to monetize this blog as you can see below. Related to that, I've discovered that Niche Pursuits Insider is a much better way to monetize my blog here. After just opening the doors for a week or so, I've already made more money than my hosting commissions for the past year. 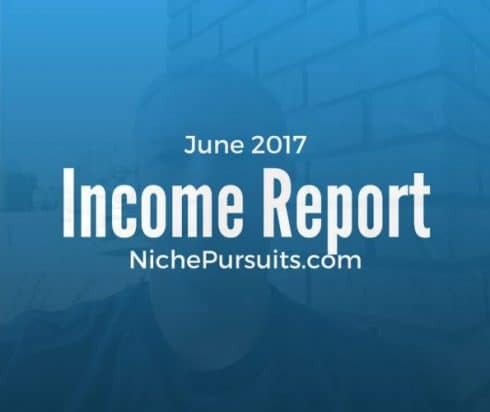 Here's the income report for Niche Pursuits. I want to point out just 2 things on this report. First, I made a nice chunk of change promoting Brand Builders as an affiliate. Their Pre-made niche sites were a hit with my email list, so I plan on doing another promotion in the next month or so. If you don't want to wait for a pre-made niche site, you can request that they build a custom niche site at any time right here. The other thing that is missing from the income report is Niche Pursuits Insider. As mentioned last month, I've decided to not reveal the income from Niche Pursuits Insider. However, I will say that it was the largest income producer for Niche Pursuits and I expect it to grow significantly in the next 6 months. You can Join Niche Pursuits Insider Here. For our home goods brand, we saw a little bit of a drop in traffic to our website and to our Amazon listings. As a result, a couple of our top selling products didn't do as well. The big drop in UK sales is due to the fact that we ran out of stock there. And frankly, I don't plan on restocking. I know that it's revenue I'm giving up, but dealing with multiple Amazon countries and the entire logistics of foreign taxes, shipping, etc is just a headache I want to get rid of. So, the UK sales will eventually drop to zero and we will just focus on the US. The silver lining is that product 3 had a great month and I'm hoping that sales continue to pick up. This is 2 months in a row that this brand is down, so I'm hoping things turn around in July. But overall, the income is pretty sweet, right? I don't have much to report on for this fitness brand. It's down a couple hundred bucks, but I don't see any major issues that need to be fixed. (We are no longer displaying Google Adsense on the site, which is the reason for a zero). I am excited about a couple of new products that should be launching this month. I feel like I've been saying that for 3 months now, but I think this time it's true. If they do launch, I expect a significant income boost for this brand. Our random products that we have on Amazon were down overall a bit. With Jake having the time of his life on a month vacation, we didn't have the man power to do much with the “Incubator”. As a result, these products just sort of coasted for the month. I think I've said this in the past, but I really am excited about this music brand. As you can see we had another great growth month! As a reminder, this brand was only doing about $1,000 a month back in April. So in 3 short months, we've over tripled the revenue to the business! Almost all of this growth has come from Facebook ads. To be completely transparent, we spent about $2,500 in June on Facebook ads in order to achieve the revenue of $3,600. However, we are profitable, so I know as we continue to tweak our ads, we will just get more profitable. The other big news for this brand is that we plan to attend a large tradeshow in order to get some retailers on board! That's right, my product that is exclusively being sold online, is going to make the jump to the offline world! Brandon (my brand manager here) and Jake will be making the road trip with a van full of gear for our booth in Nashville, TN this month. I'm hopeful to see what sort of connections and potential deals come out of this in-person event. Overall, for all my brands the income was up a couple thousand dollars. I'm happy with the way that June turned out. When you add the reported income to Niche Pursuits Insider and other projects that I have in the works, I'm feeling quite positive about the future. I've been quite detailed in the income listed above. However, I also have several other sites or income sources that I prefer not to be as detailed with. I hope you don't mind. Small niche sites making less than $500/month. Long Tail Pro Ownership. I still own a portion of the Long Tail Pro business and receive quarterly distributions based on net profits. Investment websites. I have invested in several other websites. For most of these I own anywhere from 5% to 33% of the business. Jake FBA Business Partnership. I invested in an Amazon FBA brand that Jake runs personally. Overall, I'm happy to report another good month. As you can see, not everything is growing and in-fact some of my brands are down. So, that's why it's important to not get caught too much in the weeds and look at your overall business. Do you have any questions for me? Let me know your thoughts below. Another great month for you Spencer, congrats! Had a couple questions in regards to your small niche sites, how many do you have and do you have a team and processes in place to run those or are they just passive sites you don’t update? I have some of these in my portfolio and I’m wondering if I should sit on them or outsource the tasks to acquire more growth. Thanks Logan! I still have a dozen or so smaller niche sites making less than $500 a month. Most of these small sites are totally passive, I don’t do anything (they also don’t make much money). I think the decision of whether or not to reinvest depends on the site. If its already got great content and just needs to links, it might be worth a shot. Wow man, congrats. Very insightful and inspirational. I have been trying to get your attention for a bit to no avail, I know you are crazy busy. We have an opportunity that I think would be jointly amazing. If you could reach out to me via email, I would be most appreciative. Here was the last income report for NSP 3 where I explained that I wouldn’t be doing monthly income reports for it anymore: https://www.nichepursuits.com/niche-site-project-3-update-january-february-2017-report/. “This will be the last “regular” update for Niche Site Project 3. The students have all the basic lessons they need, they just need to go back and apply the lessons that we already shared (over and over again for each article). You are doing a great job. Your income report is so transparent that builds more confident. You are helping people by sharing your knowledge. You are such a motivation to all guys and all are getting benefits by following you. Basically I am from India. I am following you from a long time. You are a good person. Keep up the good work. Wow ! It’s a big income ! I am student and i just want to earn $500/month ! I’ve always thought the different Amazon sites were a nightmare for affiliate commissions and the like. Have you thought of spinning off the rights to sell your products in different international markets? No, I hadn’t thought of that. Can we see a same of how these niche sites look like even if we don’t know the addresses. Hey spencer its really nice to see you making good money but can you tell me why bloggers like me fail. I have a website lovefindsitsway.com I get around 3000 visitors per day still I only make 400 dollars per month. I promote click bank products and I just dont know what to do and I also do not enough money to invent in softwares tools and outsourcing can you help or tell me what should I do? Perhaps try selling your own products? (a training course or book seems like a good fit). Manish – it doesn’t look like your site is really monetized all that much? 3000 hits per day should make you some decent money from display ads. Have you considered Adsense or Media.net in addition to your other revenue sources? Great report, Spencer! It’s very inspiring to see the progress you’ve made since starting this website. Would love to see income next to all expenses. Also, would also love to know more about your music product. As a hobby musician myself, I’m really fascinated by those who can actually make an income within the music industry, even if it’s within the retail sector. Cheers! Jason, the expenses are already subtracted out from the Revenue. So, my revenue is much higher than what I have listed here, but I’m just showing gross profit (Revenue minus most expenses). But I could see the advantage of splitting it out, so you could see the expenses. As for the music site, I don’t reveal my niches publicly here just because I’m extra cautious. Understood. Thanks for replying. All the best. Products like amazon product 1, amazon product 2.. and so on , are under amazon FBA? Or you ship to customers via other logistics company? Thanks for sharing this inspirational post. They are amazon FBA. Thanks! Great job! However, for your amazon businesses is each product taking into account all your expenses such as PPC, storage, refunds, etc etc? I am regularly following your emails. Thanks for sharing your experiences as well as income report. Frankly speaking, I didn’t know about blog, affiliate marketing, Amazon FBA and all these terms 2/3 months back. But I have learned something from you. I am thinking to start a blog but not decided yet about the ‘niche’. Can you suggest some of the profitable niches about which I can think about and dare to take the venture of Affiliate marketing. Thanks Arup! There are lots of profitable niches. Do a google search for most profitable industries and then look at Amazon for best selling products. Thanks for sharing your earnings. Congrats beating last month’s income!! Just to have a visual-idea of the relation between Volume of visits & Earnings. The selfie looks good to me. Congratulations for the June income and thank you very much for the motivation. Your income report makes me work extra hard on my niche, since I know that one day I will make some $$$$. Keep up the good work! 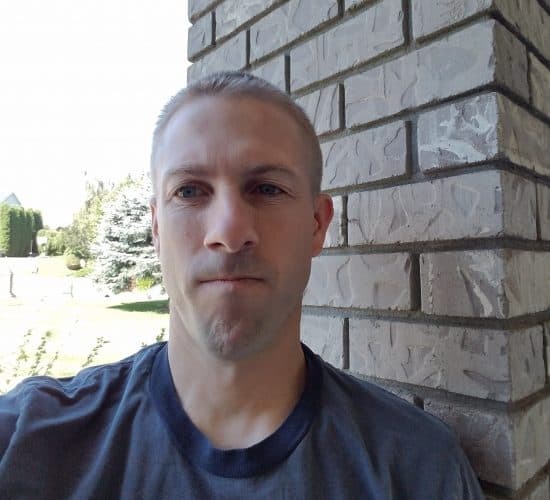 Haha, thanks…I tried to look good for the camera. Good luck! Whoa! This is incredible man. I’ve always loved your guides. Planning to start my own micro niche site. Hope I could make use of your LTP tool. Wow! So impressive! I would like to solicit advice regarding my blog if it will have a chance of getting approved by Adsense. I am a new blogger. Thanks in advance. I already subscribed to your email and I promise to do everything that I need to know in order to be successful in this field. WOW, Spencer! Really Great you are! This share makes me enthusiastic about creating a new niche blog. It would be great if you share about the traffic you have got. How much traffic have you got? or What is the conversion rate? Great job mate and it is truly inspiring. I was going through your Niche Pursuits Insider course material. Is it really helpful for a novice blogger like me? Also does it covers all the topic from keyword research to SEO? Yes, its very helpful for a novice blogger. And yes, it covers keyword research, SEO, and much more. I’m a big fan of yours. Every time, every day I check your website to gain some strength. Your works, your income report always helps me to do something amazing. Even I have bought my blog hosting through your website and still didn’t face a single problem. 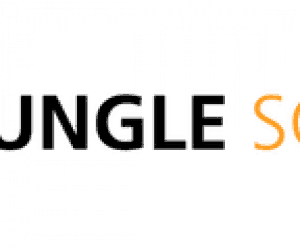 I recommend everyone to follow this website and create a niche website how Spencer told you. No, I haven’t had any issues. My adsense account is still open. Hey Spencer, what happens if i dont pay insider couse in the next year ? will you kick me out of community and fb private group ? Yes, unfortunately if your membership expires, you lose all the membership benefits (including access to the private group). Congratulations Mr. Haws on yet another growing month! I have been inspired by your work [although work on my own innovative ways 🙂 ]. It’s heartening to see your projects succeed, gives motivation to work harder for readers like myself. God bless! Congratulations on a great month. Its a testament to how hard work pays off in the long run. For your investment websites, do you approach the owners of the site or did they approach you about investing in them? They usually are trying to sell their sites, and I get involved. WOW. You are getting huge amount in profit 🙂 This is my first visit on your website. I will follow your guidelines to create my website so I can earn some bucks. This is the kind of income I can only dream about. Been dabbling in niche sites for a little while. Hoping to build a worthy authority site and sell it when it reaches its height for 20-25x multiple (market rate). How do you feel about selling a site that’s making good money for a big amount…say 50-100k and then starting a new one? Or do you like the idea of passive income only? Hi Spencer I I get inspiration all time from you. Rely you are great!! Your income is increasing gradually. Best luck of you…. all the best for next month. Why don’t you reveal the income from niche insider? I prefer to focus on the businesses I’ve built outside of NichePursuits for the most part.